How valuable is your and your volunteer servant’s time? Many churches today find themselves in the ubiquitous position of moving in and out of facilities on a weekly basis. While there are tremendous benefits, this can also come at a cost. Time required to setup and tear down becomes especially important in managing the health and well-being of a volunteer staff that is doing this on a weekly basis. We are all very aware of the impact sound has on the worship experience. It seems as though sound systems are the first upgrade. The last, and I believe the most overlooked portion of Sunday Worship services for mobile churches, are the lighting systems. Lots of things drive that thought process – one is a fear that lights may cause the service to be viewed as a performance or production. Another is the time it takes to set the systems in place. For us, the healthy balance of lighting that is not a distraction is important to the worship experience. Doing this while not becoming a burden to the servants is imperative. I am always looking for ways to improve our setup and teardown processes using the three-word filter: scalable, sustainable and repeatable. I just happened to be at a local big box music store and noticed a wireless DMX box for sale. Intrigued, I asked questions, but found limitations associated with this particular box and manufacturer. This did however spawn a quest for a solution. After speaking with the production team on the concept, we began to search for a product to fit our needs. I found there is a fairly wide gap in pricing and performance with products out there. Through several hours of research and comparing product we came upon City Theatrical’s SHoW Baby5. Let’s just say “I was blind, but now I see” the benefits of wireless DMX. Out of the box, the system was unbelievably simple to setup and operate. Each of the units can serve as either a transmitter or receiver. The fact that there are five different frequency bands for the systems qualified my sustainable requirement with the wireless environments we work in. It was a simple matter of acquiring some 5 pin to 3 pin DMX adapter cables to integrate the SHoW Baby components into our exiting systems – two color light bars, two spot ellipsoidals. After taking literally two minutes to explain the system operation to the setup team, the overwhelming response was “sign me up”. Implementing the product reduced setup time and teardown time for two people; approximately 15 minutes on both sides of the service. I found the Show Baby use/application simple to repeat on a weekly basis. We attached the product to the light bars and ellipsoidals we are using. The most difficult portion was determining how to get power to the receivers. An IEC to Edison adapter allowed us to use existing light bar power out to drive the boxes. Now setting things up was a simple matter of opening a light stand, setting the devices on top and pulling power to them. All the connecting signal cables – gone; extension chords from FOH DMX dimmer pack to ellipsoidal /spots – gone. Signal cables from FOH to stage – gone; tape to cover power cables at entry way – gone. Our process was simplified and ensures an easy repeatability. The last part was scalability. How simple is it to add more lights? Prior to SHoW Baby, we had an issue of not getting any lights to the drums and having insufficient stage light for video recording. Not wanting to pull more cable, we thought it would be great to try adding wireless stations. 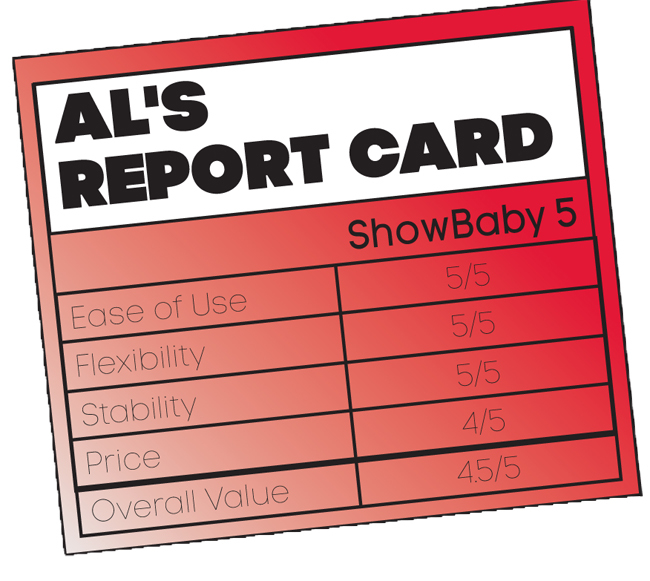 With SHoW Baby 5, we plugged into the lights on the drums, addressed them and it was done – that simple. We were running power cables from FOH dimmer packs to the spots in the wings but, by relocating dimmer packs to the wings and using wireless DMX, we were able to increase our total number of spot lights to four. This had a tremendous impact on our video recording quality and set the stage for live streaming. All I have to say is wow! So what are the drawbacks to wireless DMX systems? I have found only two. At this price point, this may not be a solution for some users. There is hope, however; you can buy two boxes and get rid of the longest cable run to start. As you have the capital, you can increase the number of boxes used in your system. There are less expensive solutions out there, but they come at the cost of flexibility, range, and reliability. Secondly, the manufacturer you pick is the one you’ll live with – communication protocols are proprietary. There are some more expensive solutions that allow use of open protocols between multiple manufactures, however I believe unless you are a touring act that can justify the cost, it is impractical. For us the solution was clear. 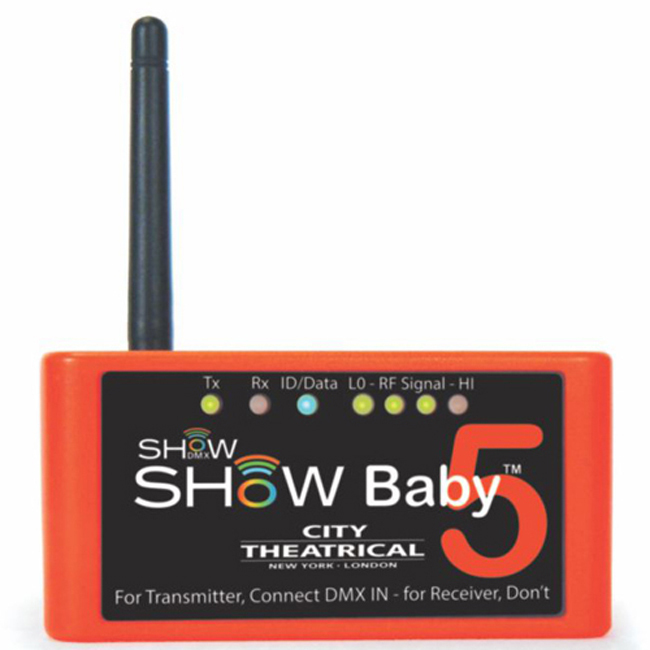 SHoW Baby 5 from City Theatrical provides the best balance of cost and features in a product solution that is scalable, sustainable, and repeatable – saving us something we cannot buy enough of – time. As a former worship leader, God has allowed me to see some things from a unique perspective for “production”. Look at your people and processes through scripture. As I mentioned earlier, I noticed that in order to deliver a consistent worship experience today, our systems and procedures needed to be sustainable, repeatable and scalable. This has allowed us to be good stewards of resources – both people and product. We have had a tremendous drive to improve quality of sound with limited professional experience of servants. We used a modular approach to simplify our sound system process and increase the likelihood of a consistent Sunday Worship experience. Wireless DMX from City Theatrical appears to be the next step for us in simplifying our Sunday morning process while improving the lighting in our worship experience and is in keeping with our modular approach.